Abby, Dodie, and Clara Foster, three 60-something sisters, are astonished to learn they've inherited a dude ranch in the Alberta Foothills. Facing financial ruin, they host a week-long horse breeding symposium to attract more guests. Hours into the symposium, a cowboy's sudden death appears accidental. When the Mounties dismiss Abby's notion of murder, she convinces Dodie and Zeke, their hot barn manager, to conduct a covert investigation without alerting their guests. Problem is, the quirky guests are their main suspects. 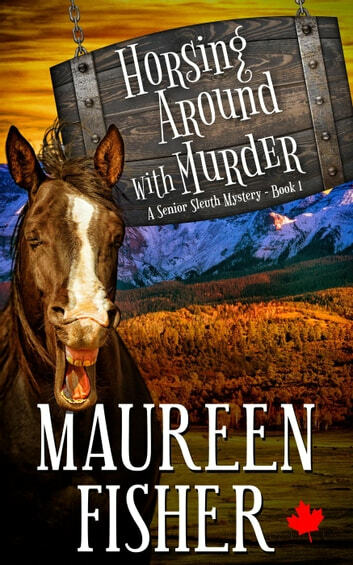 Chaos ensues when the senior sleuths tangle with one seriously amorous gelding (yes, it happens), a runaway stud, dwarf goats and their guard llama, a cranky stallion, drug abuse, deceit, and more danger. It doesn't help that late-life romance ups the ante. "Great fun to read! I love it! Laughed out loud and enjoyed all the characters." "The physical comedy infused throughout gave me several actual laugh-out-loud moments - the mark for me of a great read." " I LOVED IT!!! What a fun cozy mystery."